Well, Rylee finally figured out the theme she wanted for her birthday party this year. Angry Birds won out over Dora, but I don’t think by much. In order to keep the momentum going toward AB, I started planning right away and made sure to keep her involved as much as possible. And so, 4-ish weeks before the date of the party we worked on the invitations. I downloaded a free AB invite from here and when filling in the info, I let Rylee choose the colors. We printed them out the next day, I let her do some of the cutting and she glued the invites onto colored backing. That same night, I went into our “office” to look for the extra 5×7 envelopes I keep on hand for occasions just like this only could not find them anywhere. I figured, no big deal, I’d go to the store and pick some up on my lunch break or something. Then a week came and went and those invites continued to sit. “Soooo…do me a favor and pretend that you got this in the mail and that I’m not just too lazy to go buy envelopes. Deal? I hope everyone can make it! Not exactly what I had planned, but it got the job done. sealed up with Reese’s 6-week/newborn photos. Six.Week.Photos. She’s NINE MONTHS OLD! So…my reflection for Mother’s Day…mothering? Yep. I do it. Kinda. 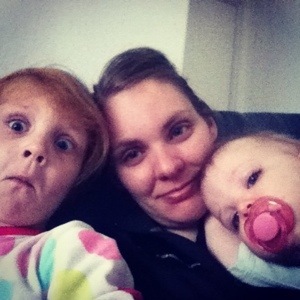 This entry was posted in birthday, mom fail, montser on May 9, 2013 by katherine.